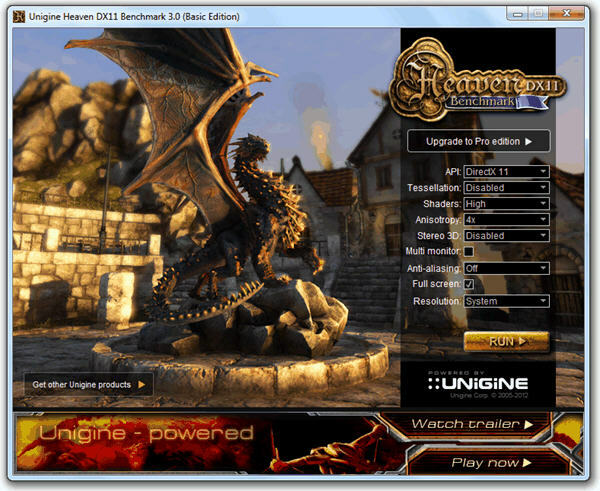 There are so many benchmarking programs that can use to benchmark the performance of your GPU and one of it which I’ve settled with is Unigine Heaven Benchmark based on advanced UNIGINE engine. Previously I’ve used the older version of Heaven Benchmark 2.1 to benchmark the 3D graphics performance on the antivirus performance test. Reason is during that time Unigine Heaven Benchmark was the first to support DirectX 11, while many still stuck at DirectX 10 plus it is free for personal use. It is also easy to use, simply install, select a few options and run the benchmark. A score will be given at the end of the benchmark together with the minimum, maximum and average FPS numbers. 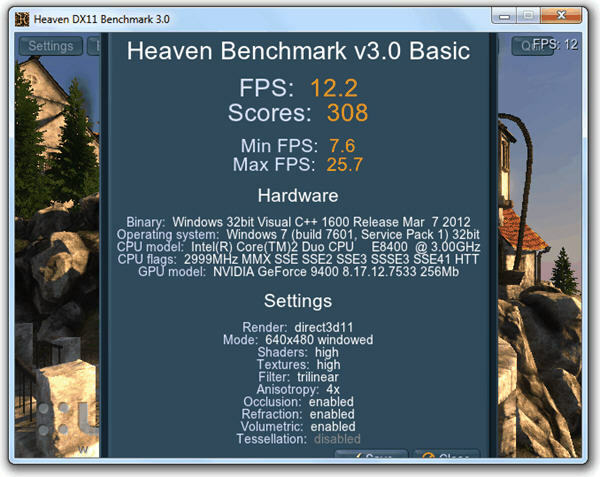 The current latest version of Heaven Benchmark is at 4.0 with many technical improvements, it now runs on Mac and supports for variety of new hardware, including extended support for multi-monitor configurations. The Heaven DX11 Benchmark 4.0 installer file is quite large at 247MB in size. After installation, running Heaven Benchmark 4.0 will open up a window allowing you to select some of the options such as DirectX versions (from DX9 to DX11 including OpenGL), Tesselation level, shaders level, Stereo 3D, resolution and etc, to use in the benchmark. Click the Run button when you’ve done configuring and then either hit the F9 key or click the Benchmark button to start the benchmarking your GPU. The program will go through 26 stages of tests which takes about 4 minutes 15 seconds to complete and then shows you the average FPS and score achieved by your GPU on the benchmark. You can also save the benchmark results to your computer in HTML format. My test system got a terrible result of only 12.2 FPS on average because it’s not a gaming machine and it uses a built-in GPU. first, thanks for this tip, and now the problem : downloaded the torrent version, after instaling ( with Revo Pro ), when I click on the desktop icon, instead of running the program, it opens the bat file on the notepad!? Re-instaled withou Revo. Same result. Now trying to download thru IE – did not accept to download using DAP in Firefox. Reinstaled once again to no avail. So I’m just uninstalling the whole thing and not going to loose more time. Most probably something on my system is preventing to run this .bat file.